There do still appear to be issues with this model Mac, this fix is not unfortunately working for everyone. Any and all feedback is greatly appreciated. If these instructions are not working, try substituting “IntelHD5300” for “HDGraphics5300”. I have a 2011 Macbook Pro & am having some issues getting sims3 (and the expansions) to work. Is there anyway you can help me? At first I was having issues with the sims game loading. It was just showing the blue screen. 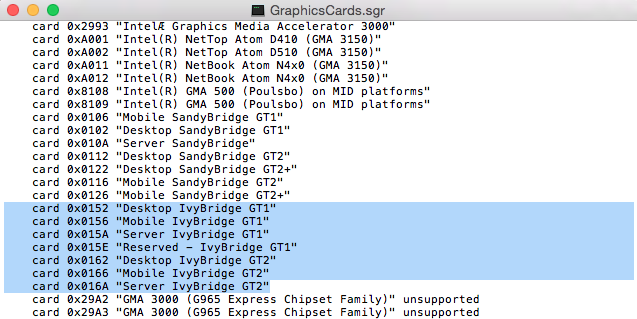 I tried your fix “Intel HD 5300 – 12″ MacBook” and it worked until I downloaded the expansions. I uninstalled everything and reinstalled just Sims 3, did the fixes as shown above and now it’s still not working. Your Intel HD 3000/AMD Radeon graphics are supported in the game so this fix is irrelevant. You can see the lines for them in the GraphicsCards.sgr file. If you have CC/Mods then move them out. Purge RAM regularly and don’t run anything else on your Mac whilst you play. There are a lot of issues currently running the game in El Capitan and Sierra. I am having this issue on a MacBook 2011 also, did you ever manage to resolve it? Hi, I have MacBook, retina, early 2015 edition, and I have just recently downloaded the Sims 3 through origin. My game, like many others keeps getting stuck at the launcher and will not let me play the game because it “Cannot start the process when the game is running. I followed all your steps, but I got stuck because I do not have the GraphicsCards.sgr file. If someone could please help me that would be great. If you do not have the GraphicsCards.sgr file in the base game folders after installing then maybe the installation was corrupted? Are you definitely looking in the right place? these parts and don’t replace them? Is there any reason for replacing? Do you have Sims4 GraphicsCards.sgr and GraphicsRules.sgr? I want to see those files. The idea of my site is to help others. If I give you the sgr you could try the fix, it will work for you, but I won’t be any wiser as to what you have added. If you would like to help others with your Intel chip then please, provide me with the device ID so I can edit the files and upload the text to c/p. I don’t just help one person, I like to help the Mac community as a whole. I’m also pretty sure your device ID is 0x161E.And yes, that ID is in the TS4 sgr file. And I want to help others too. My device ID is 0x161e. u’re right. I will countinue to find a solution. I don’t even have deviceconfig file. No Sims 3 folder in the Electronic Arts folder in your Documents folder? I reinstalled the game 3 times, but there is no file. The folder is created when you launch the game. Manually uninstall then reinstall base game, apply the 1.67 patch, c/p the sgr info into your sgr files then try to load the game. You must understand that the game is simply not supported on your Mac though so you may never get it to play.